Nestled between the mountains and the sea, this lovely house is ideal for exploring this dramatic part of the Highlands.. Enjoying lovely views across the waters of Applecross Bay and on towards the beautiful islands of Raasay, Rona and Skye, this detached house makes a great holiday base for exploring this lovely part of the Highlands. Set amongst some of Scotland’s most dramatic and rugged scenery, Applecross nestles between mountains and sea and can be approached over Britain’s highest road pass, The Bealach Na Ba. Wester Ross, home to the eagle and pine marten, with seals often seen in the many coastal inlets and stags roaming on the heather clad hills. Fantastic area for climbing, hill walking, mountain biking and fishing. Shop 10 yards, pub and restaurant 1 mile. Ground floor: Living room. Dining room. Kitchen. Utility room. 1 twin bedroom. Bathroom with shower over bath and toilet. First floor. 2 double bedrooms, one (5ft), both with sloping ceiling and Velux. Shower room with toilet..
Lawned garden with sitting-out area and furniture. 1st comment: This cottage is just simply wonderful - so clean and roomy. Beautiful views and a fantastic location. The little touches were very much appreciated too (packet of biscuits left for us and a pint of milk). I did not want to leave!! I forgot to leave a note in the visitors’ book, but myself and my 2 children loved our stay, it was perfect despite the weather. 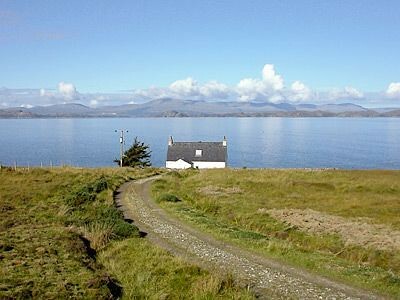 2nd comment: Lovely Well Equipped Cottage in a beautiful but remote part of the UK. Visited at Xmas 2011 but looking forward to going back at some othe time of year - Spring time! 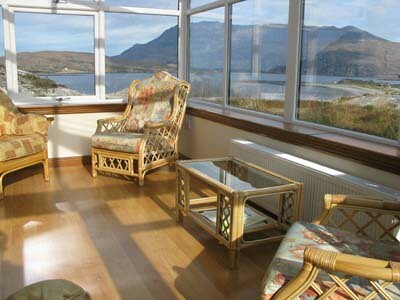 3rd comment: A superb property, very comfortable, tidy, well-equipped, and very well looked after. Can’t think of anything to complain about or any suggestions for improvements (apart from maybe supplying a bread knife - but the triviality of that comment is telling in itself). The location is very good - nice to have a pub / restaurant within walking distance. 4th comment: Good location with fabulous views. The house was warm and comfortable. The shop next door is a life saver!